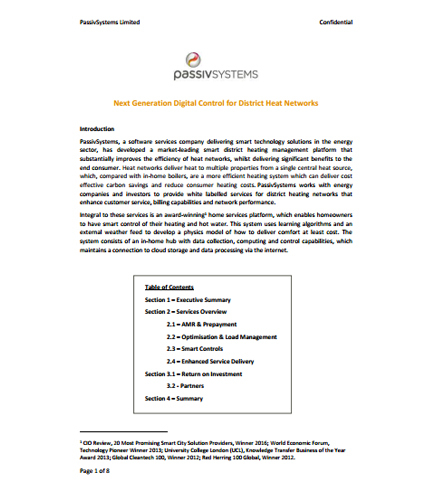 "Digital Control for District Heat Networks"
Creating a Smart District Heat Network is far from simple, and requires input not only from heating experts, but also from IT specialists and financial consultants. Between integrating renewable energy resources into existing systems to using information and communication technology, district heat operations are set for change. In this informative paper, innovative technologies and advanced system concepts in district heating are described for heat distribution and end user utilization. It aims to provide background materials and cutting edge knowledge for designers and decision makers in the building and district energy sector. What are the requirements of a smart heating control system for district heat networks? What is the role of district heating in future renewable energy saving? What are the benefits of having a smart District Heat network? What is the average cost of heat for the range of district heating options and stand-alone renewable heat technologies with electric and gas heating? How return on investment in a district heat network can be improved? Read this whitepaper that highlights a next generation heat network modeling and optimization platform that improves performance, delivers annual OPEX savings, and empowers customers.